La Vergne’s pallet garden is filled and growing. Got it done, finally! 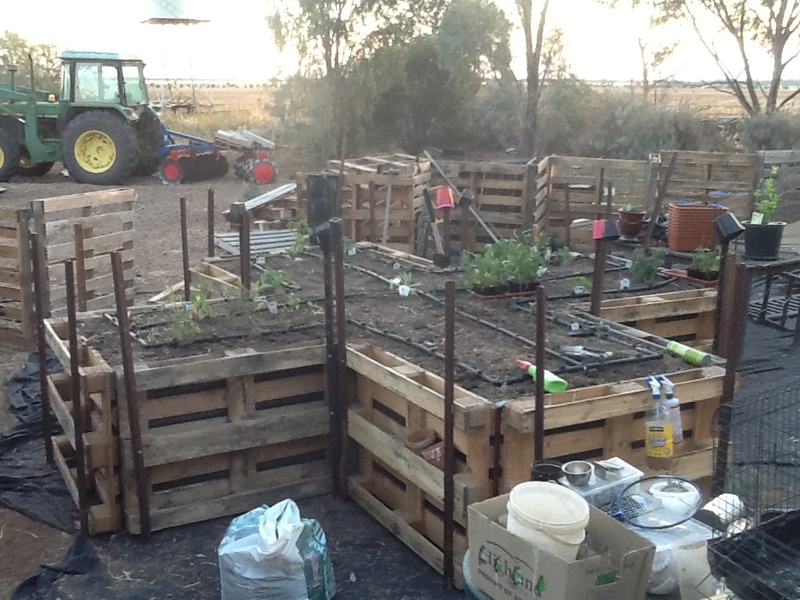 My wife has wanted a functional proper sized raised bed pallet garden for planting in spring. 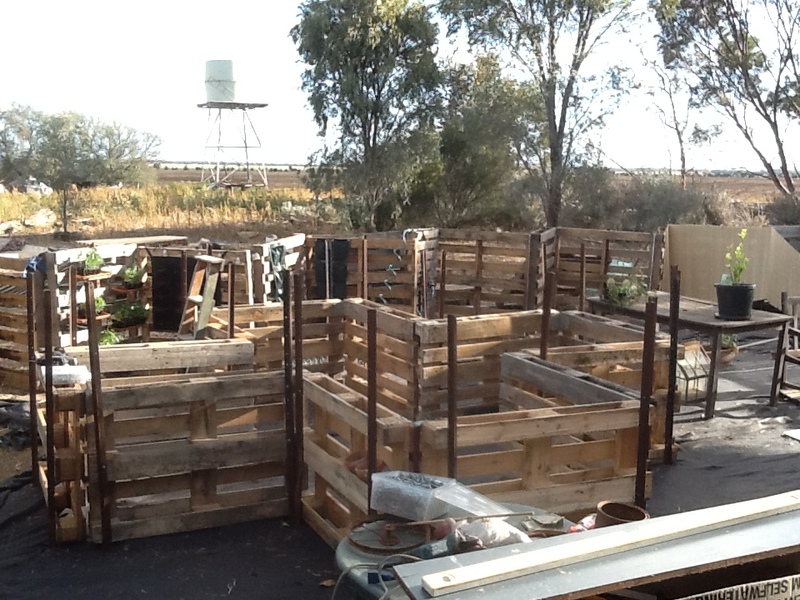 I have been collecting pallets from around the area for some time and a build up of similar types was finally occurring. It is very difficult to build with different sizes, shapes and strengths so you have to wait till enough of one type accumulate. Now that has happened her garden could happen. First we laid out three strips of geotech over the racked ground to level the site and remove sticks and stuff that might pierce it allowing roots through from two close by eucalyptus trees. 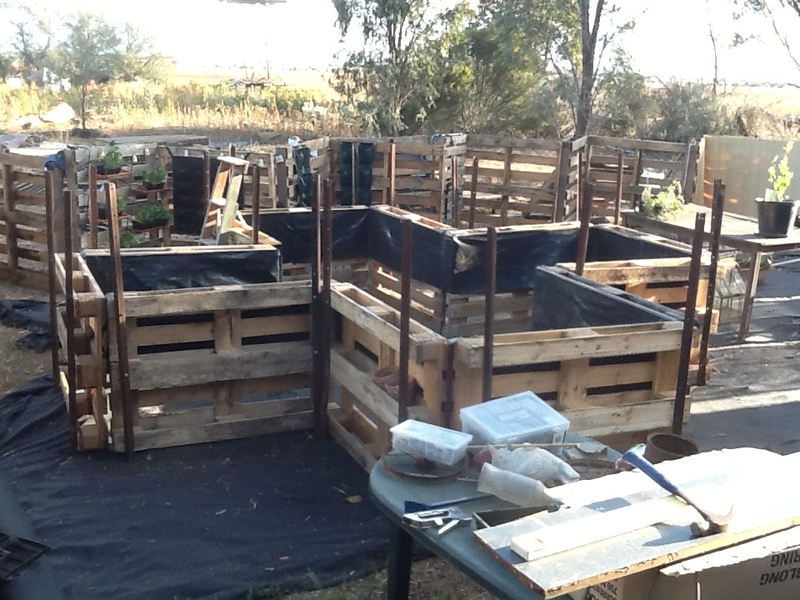 Then 12 pallets in a cross shape were laid out and leant them against each other to determine exactly where to place it in her garden space. It had to fit close to the pallet wall but not too close and still give enough room for the Japanese styled solitude garden next door. Once in place two star post were driven in and tech screwed solid. 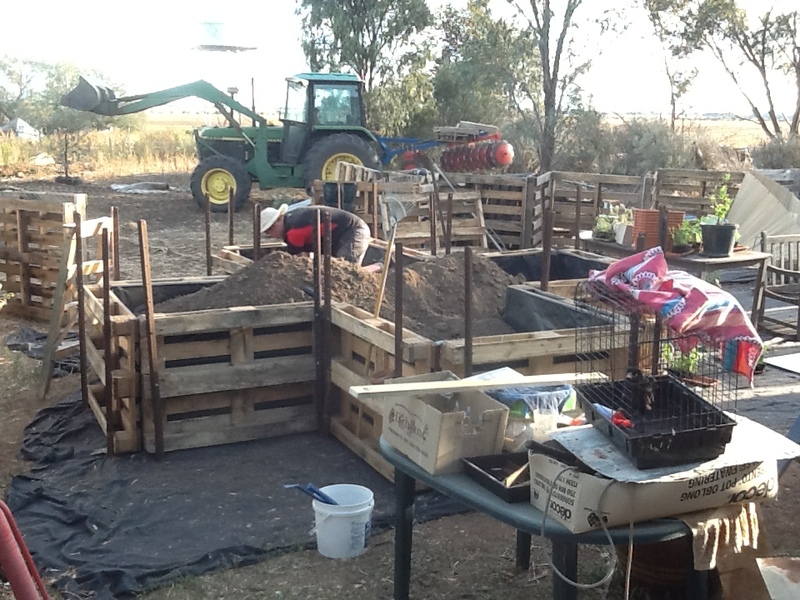 After the initial shape was made a lining of builders plastic 500mm wide was stapled in place along the upper portion of the bed and a geotech strip again 500mm wide behind the plastic and long enough to drape over the ground forming a barrier to letting any soil under the wall. Pallet wall and east arm of the pallet cross. 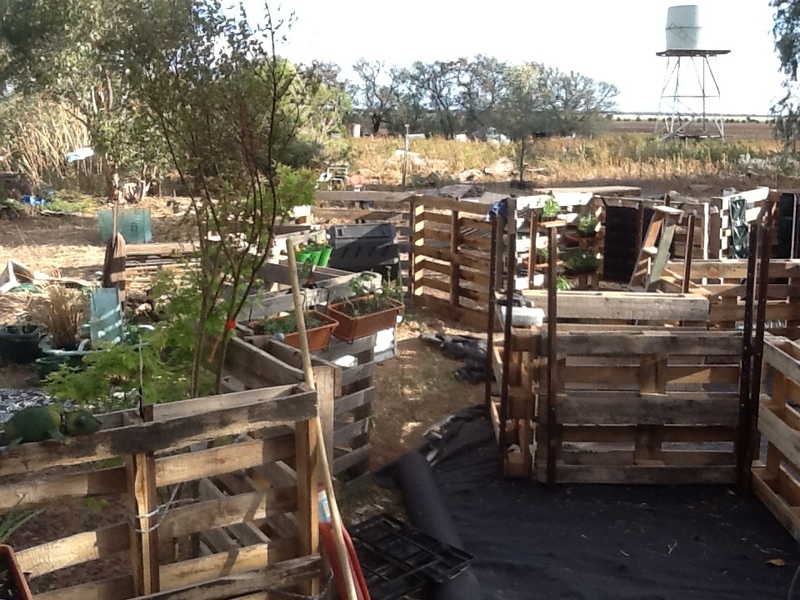 The pallet cross and south pallet wall. Western part of her garden showing basic siting of her three tiered pond, stone pagoda and napping Buddah. The house from where this pic was taken protects the area from driving hot summer winds and the tank and wormwood hedge with bamboo screens trap most of the damaging westerly winds we get. This spring has been the windiest in my lifetime with damaging wind one day a week at least. 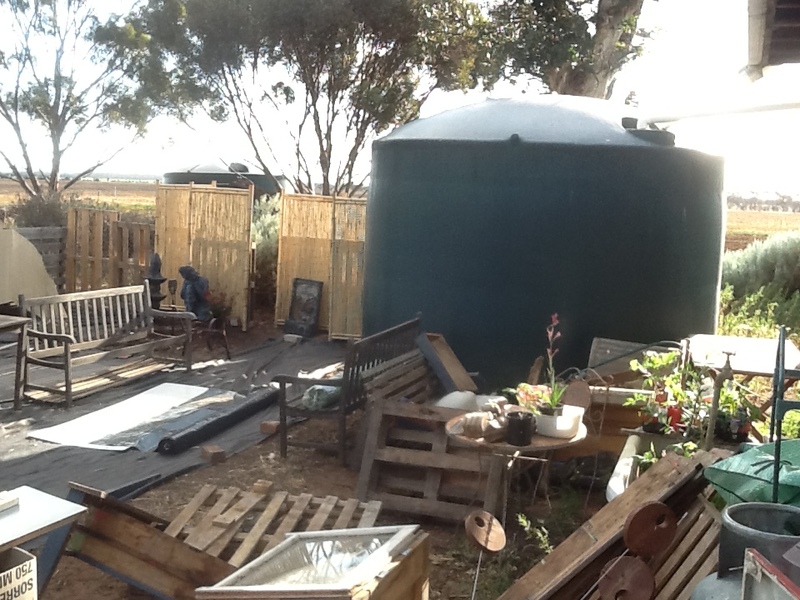 Our bush food planting behind the tank are yet to really establish and assist in keeping the winds down so we just have to live with it for now. Builders plastic done with the strip of geotech next to get stapled. Dirt in with Lachlan spreading it out and tamping down. Finished bed with dripper system in place, plants she wanted in and alls well. Earwigs are not a pest problem till they get up in numbers so much that their regular diet is depleted and they start chewing on things you would prefer they leave alone. Like cherries, young tree leaves, strawberries and even rhubarb leaves which I hope they get a gut ache from. They leave some things totally alone but ravage others to the point of destruction, like the pot marigold on the left. 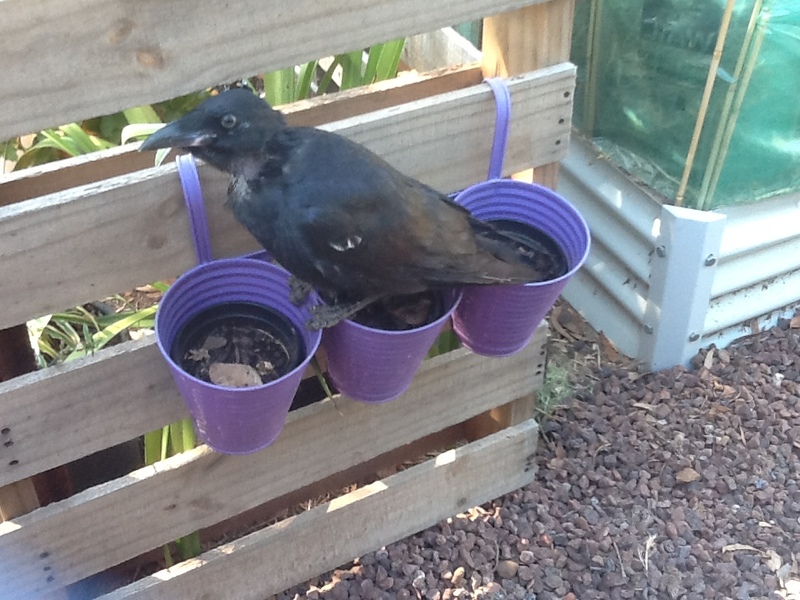 They hide underneath the pots in all three in equal numbers but only eat the one plant. 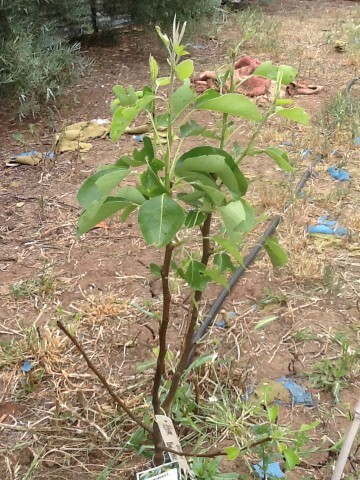 This young pear has been stripped of all new leaves, so I started an experiment with two goals. 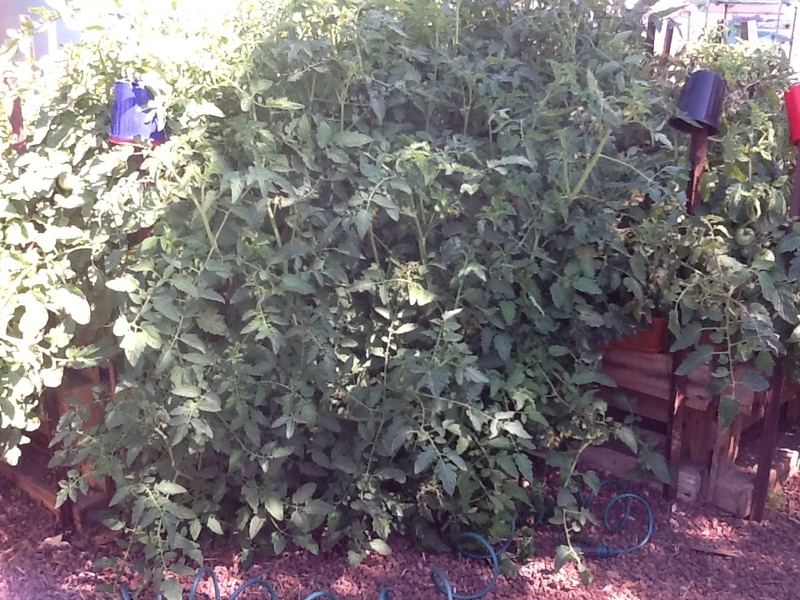 To find a way of deterring them from certain plants. To find a natural way of trapping then eradicating them. I made a spray mix of Tabasco sauce, detergent and hot chilli sauce. Strained through muslin and sprayed onto leaves of a tree being torn to shreds. 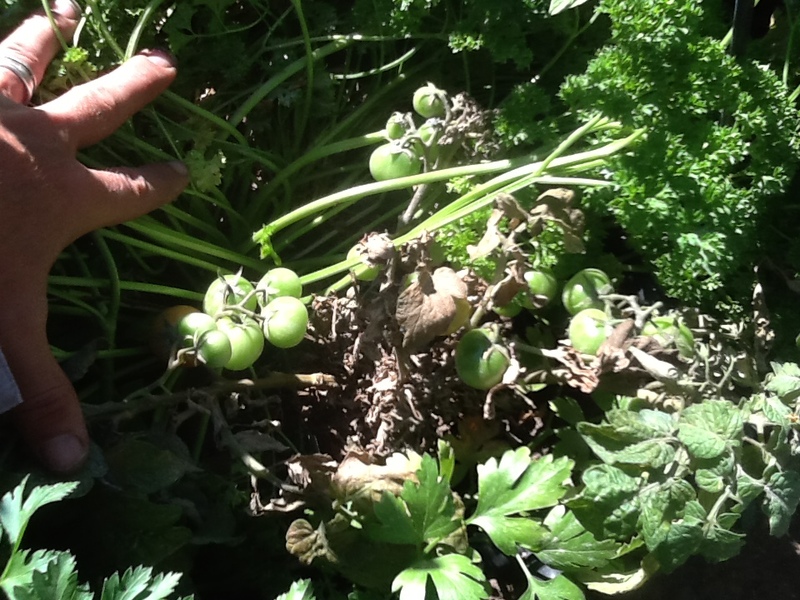 The result being the leaves sprayed were not touched but those below were still being eaten. As shown here the top is untouched while the two lower branches are eaten, the left branch totally stripped. 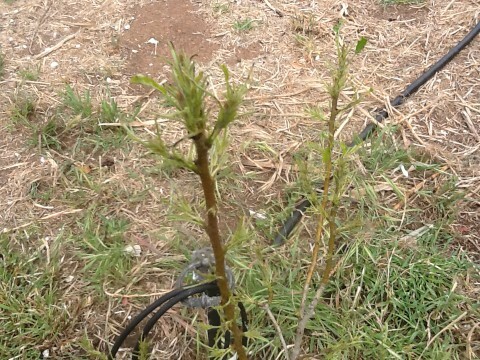 Note the new shoots at the top are untouched by earwigs and not affected by the hot sauce spray. That part of my mission is complete. Now to the next challenge. I placed old blankets, sheets of tin, wood and lino strips in the orchard between trees to provide shelter for the earwigs during the day. 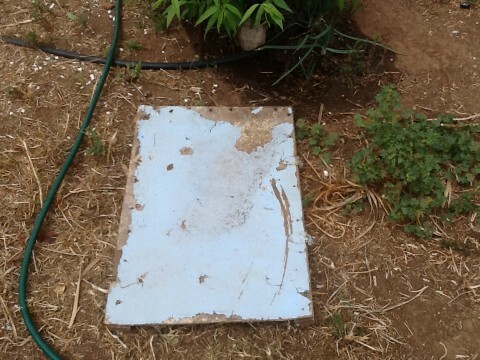 The worst one was the tin sheets as it got too hot and nothing stayed beneath it for long. 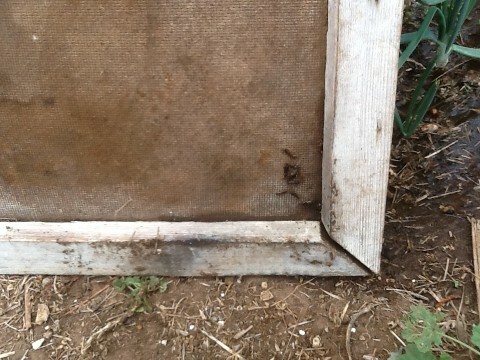 The others all worked well with the best being an old cupboard door as shown below. Not many shown here as its not easy to flip a door and get the Ipad up to shoot it. Suffice to say it works and now I had to find a way of killing them on the spot. During one of my workshops that I hold around the place, an older lady was telling me how her mum used soap to kill a lot of bugs she didn’t want in her veggie garden. This was back in the days before off the shelf pesticides were available. Her method was to cut a small piece of soap off a bar, place it in a bottle of water and shake to dissolve the soap piece. She then poured it onto any infestations and re-covered them. Evidently the soap breaks down the insects skin and kills then. 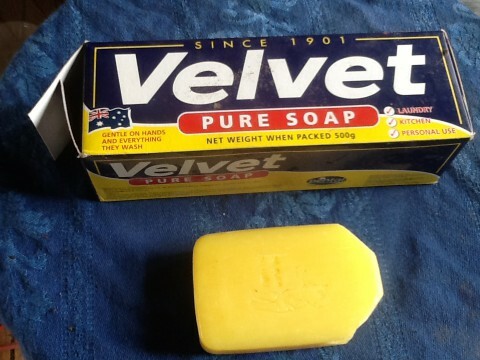 So I tried it with the only soap still around from those days, Velvet Soap. I caught some earwigs and gave them a light spray, within an hour they were dead. Now every morning after the first coffee I patrol the traps or hides and squirt any beasties found there and re-cover. I have found more drop-tail lizards/skinks, scorpions and centipedes in the garden as a result. Not keen on the last one as they can get very large, up to 20cm long and dark olive body with red legs. Nasty! Still working on the scoria base, other projects/priorities keep getting in the way, but this shot shows the lush growth of tomatos, eggplant, chives, strawberries, afro and italian parsley, kale, mini cabbage, zucchini, rhubarb, yarrow and other herbs. 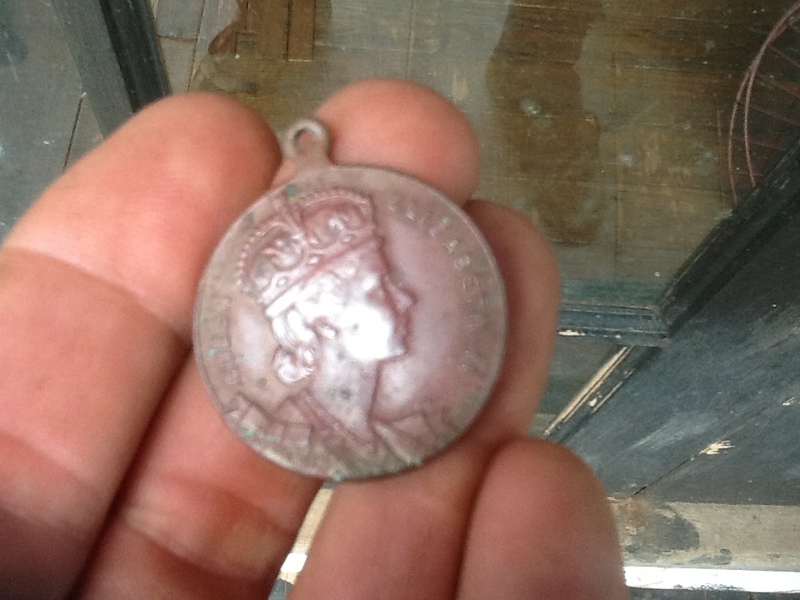 A 1953 coronation medal! 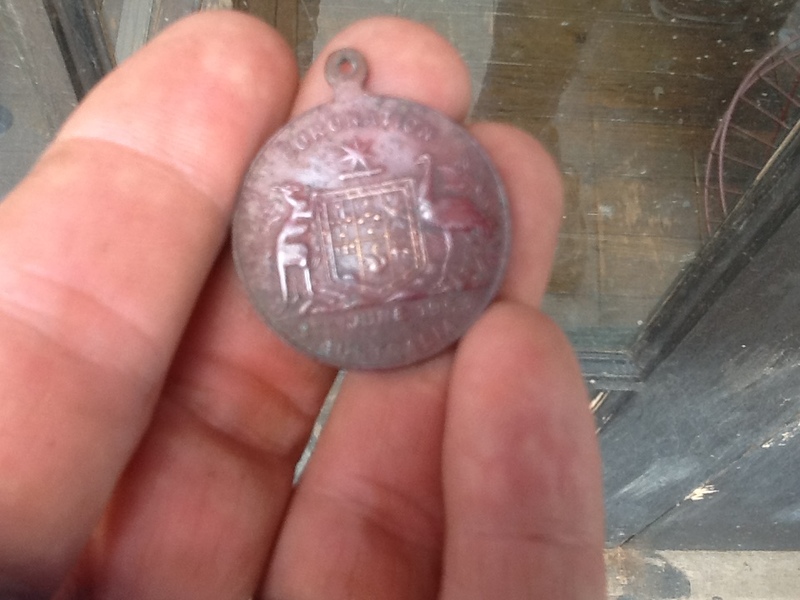 Buffed it up a bit and showed Father who reckoned it was on of his siblings who lost it way back when. 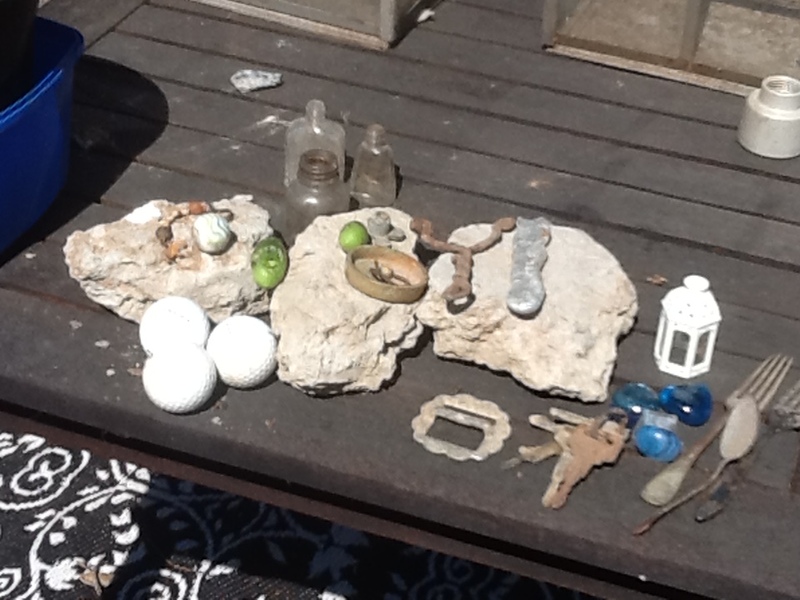 He also said there is an engagement ring in the vicinity that was lost when one of his sisters was playing with Nannas ring. Hope he finds it! 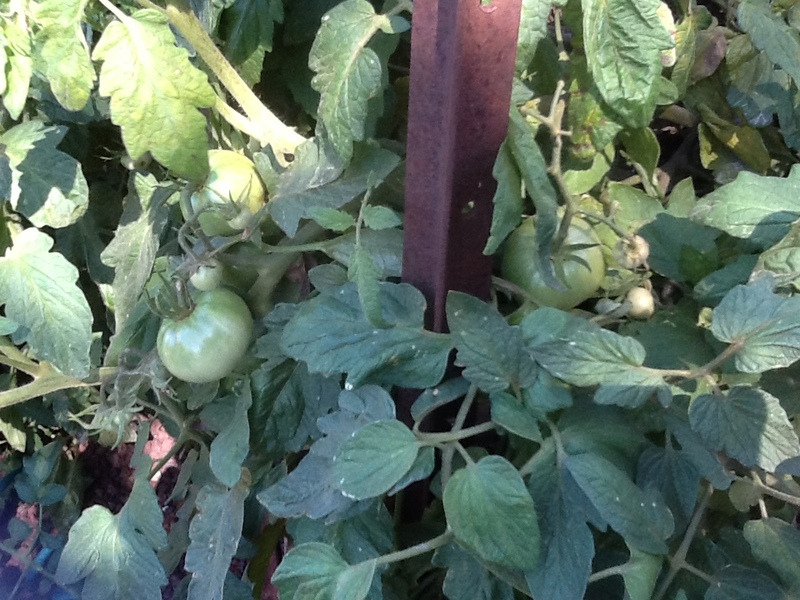 Any ripe red tomatos Heckle claims as his/hers so they have to be picked early and strawberries are now covered with bird netting which foils him/her. 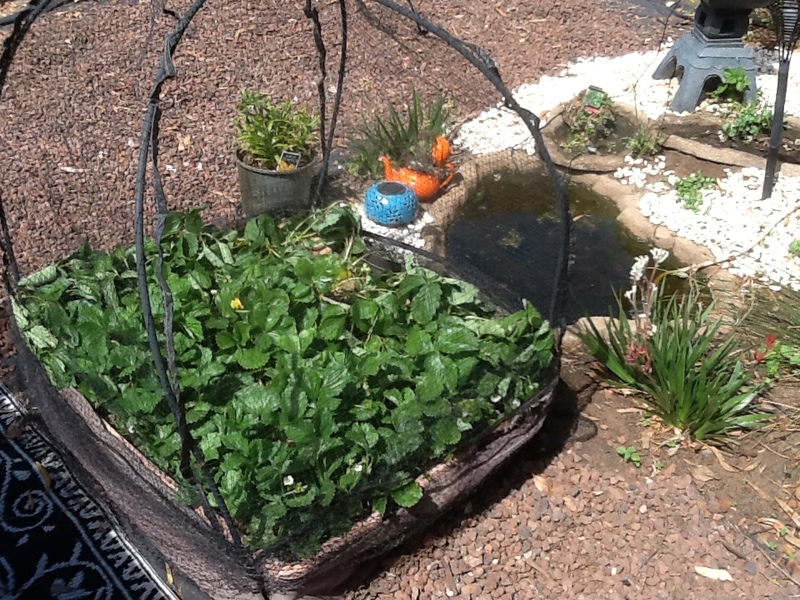 This entry was posted in Aquaponics for everyone, Updates and tagged earwigs, garden, Pallet, recycled, Sea Weed Extract, sustainable, Velvet soap. Started a seed library for real now, you interested? The Garden of Earthy Treasures has now opened a Heirloom Vegetable seed library with over 280 varieties cataloged to date and approximately 8,000 seeds. Anyone can join and add to the collection and then be entitled to withdraw any type of seed of the same volume or less. 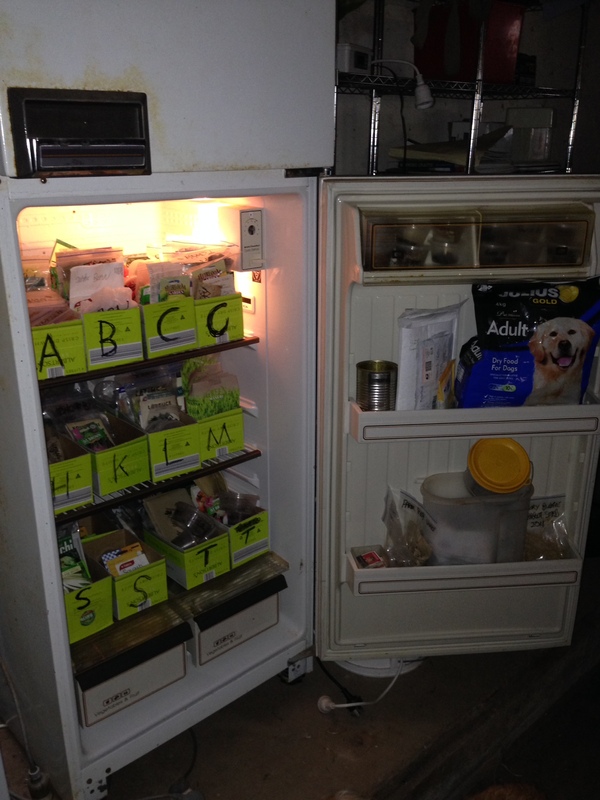 This is one of two fridges and a chest freezer for other seed needing the lower chill factor. We have added a database of all seeds collected with details on source, amount, planting notes and any other relevant info. We have also concreted our loaning criteria so those of you who have contributed already have your seeds fully protected. 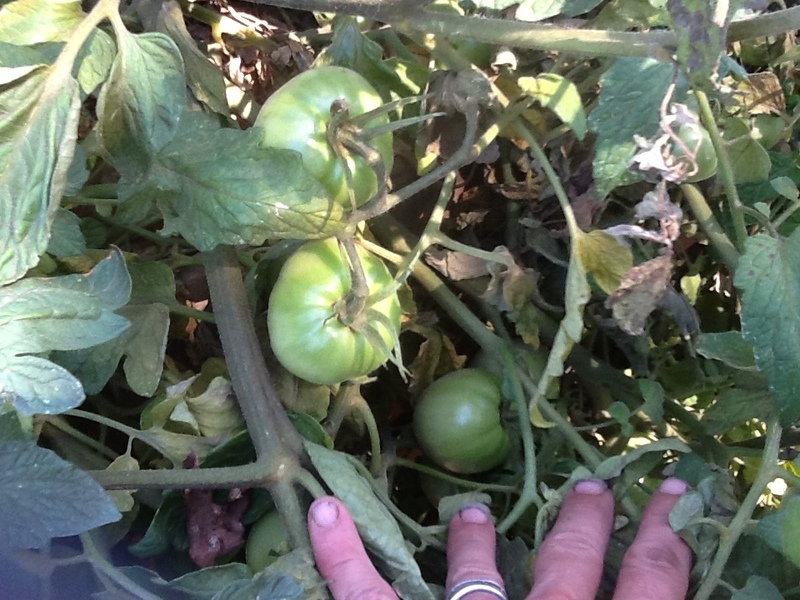 All seed is to be heirloom variety. No hybrid types at all. What you put in you can get out in other types of seed either in one lot or many smaller lots. eg. depositor puts in 100g of lettuce seed so can take out 100g of one plant or 10 lots of 10g of any assorted seed or any combination there of. That’s it! Keeping it simple but if you think there should be any additions let me know and I’ll consider them. Thanks to the new members and now another 145 varieties is store! Looking at having another fridge installed to take more seed and am working on a database to detail member details and their contributions. 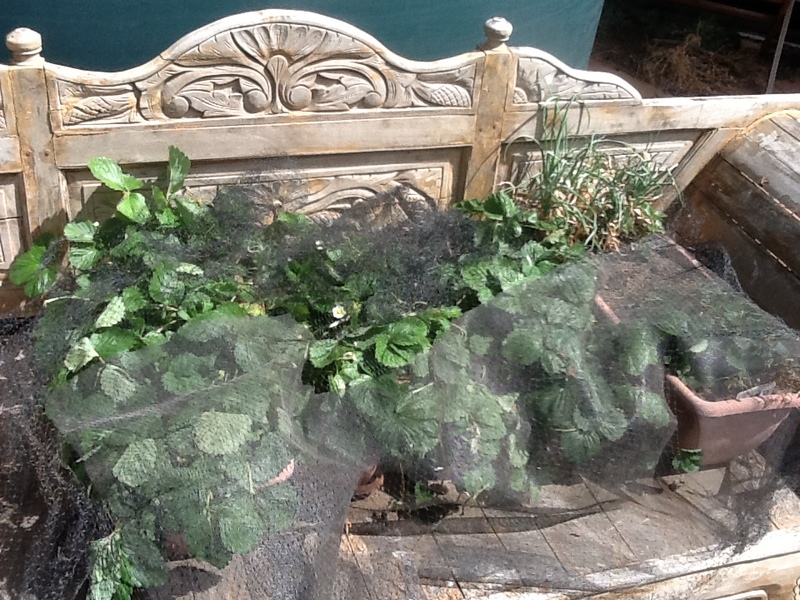 Just finished adding another 93 varieties to the fridge and planted out most of the brassicas, see my other post. Have decided against taking species and varieties that are likely not to do well here, tropical plant seeds are a no go. Have sourced second fridge to take the extra seed and been through the database. 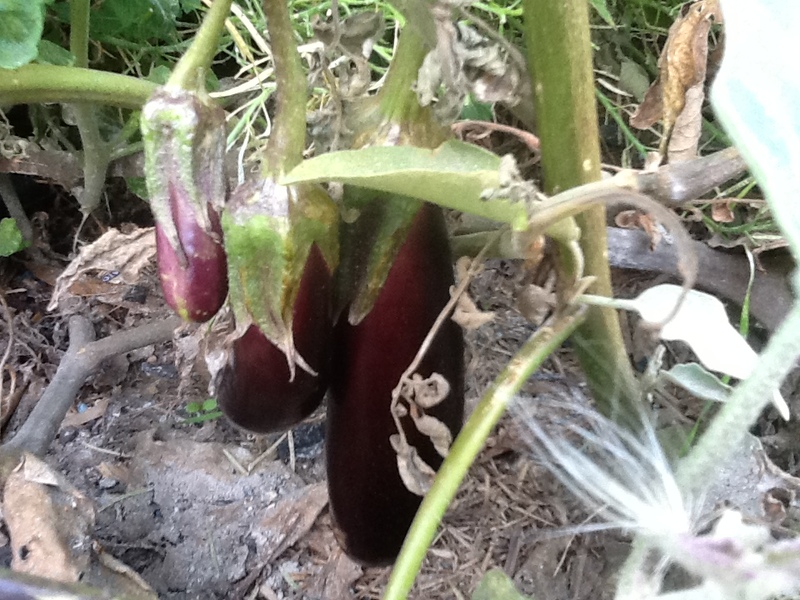 The seed older than 2013 will be donated to Community Gardens in the area. 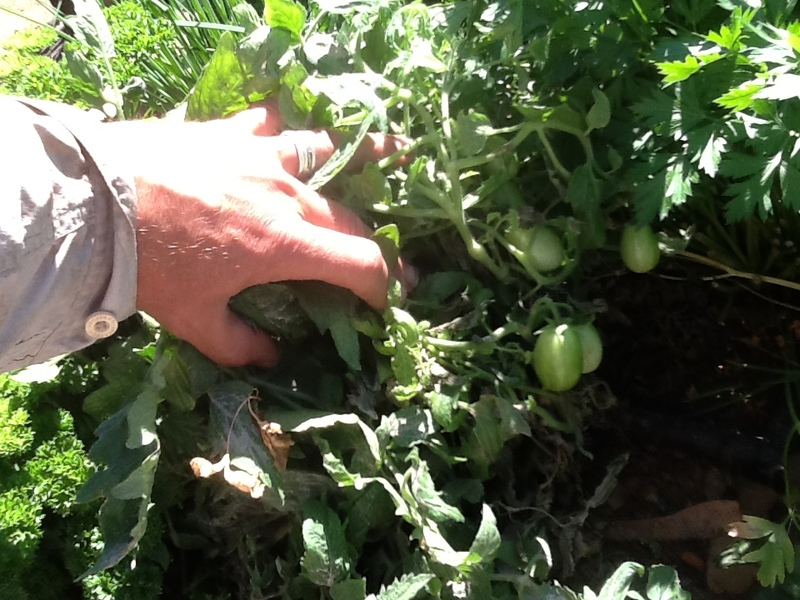 This entry was posted in Aquaponics for everyone and tagged Heirloom seed, Heirloom vegetables, permaculture, seed library, sustainability.